Space22 - located just outside Exit 1 of Gangman Station - will be hosting Sohn Dae-Kwang’s photo exhibition <Gwangmintang - There is a time for everything>. It is a celebratory exhibition for the venue‘s third anniversary. The exihibit, sponsored by Mijin Plaza, will be running until December 30th. It is closed on public holidays but is otherwise open from 11AM to 7PM. Visitors will have the chance to meet the artist himself at 6PM on December 21st (for queries call 02-3469-0822). Photovil has previously introduced some of the pieces that were originally shown last August (a month to be remembered for its unreasonably hot weather); those photos have finally arrived in Seoul. It is, if the Seoul-centricism can be excused, good news for the Seoulite audience for whom Busan was too far away. As such, I wish exhibits based in Seoul would tour around Busan, Daegu, Gwangju and Daejeon as to permit regional audiences to visit with ease. 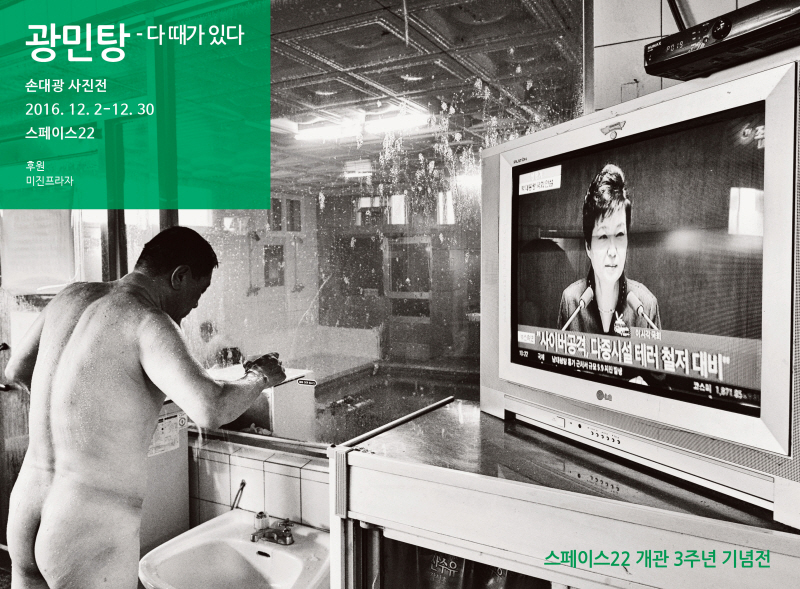 <Gwangmintang - There is a time for everything> is an exhibition of photographs Sohn Dae-Kwang has taken in the men’s bathing area of Gwangmintang, a small public bathhouse that once existed in Busan. The last time I interviewed Sohn in Busan I asked him whether he would be willing to photograph the women‘s bathing area if the opportunity presented itself. He did not reply. Back in 1998 photographer Park Hwaya held a similar “bath” exhibit - Park, a woman, had photographed women’s bathing areas. The reason I mention this is because of the expressions of the subjects in Sohn‘s photos. It may well be impossible for a male photographer to photograph women’s bathing area and vice versa; after all, even a man documenting men‘s areas does not sound very plausible to me. How experienced a photographer must one be, for the subjects to stay indifferent while exposed to a camera in bath - especially considering the fact that they are starring in a documentary-style project and not posing at attention as they would in a boring photographic typology? And so it inspired the title: “Photographer, Rather Than Photographs.” Imagine someone staring at you with a camera when you are sitting in bath scrubbing your back. I certainly would ask for a second chance after I have had the chance to work out. Sohn Dae-Kwang’s Gwangmintang is precious. His work makes us realize what kind of photos we need - or, what needs to be photographed. It is an exhibit that embodies the principle that you do not fly to the moon to take photos of aliens, but rather those who are closest to you - and they are the ones you should photograph for. It is a principle that is as basic as it is difficult to adhere to. What is important is not the photographs themselves but the attitude of the person taking them. It would, for instance, be dangerous to offer alcohol to the homeless in exchange for the permission to photograph - such photos are taken solely for the sake of the act of taking them. So, what was needed to take those pictures at a public bathhouse? 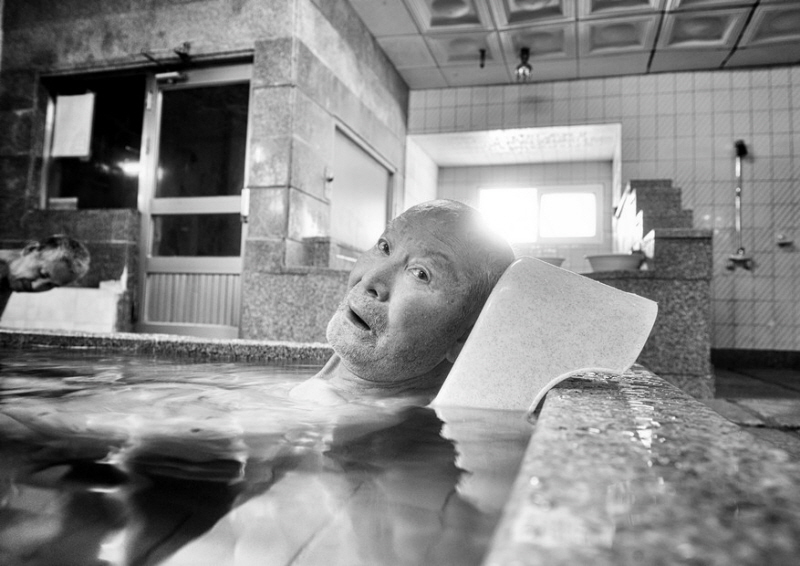 Park Hwaya, who photographed women‘s bathing areas, said that she would visit the bath almost every day, and actually bathe. So did Sohn. It would be an impossible feat for a public bath-hater like myself. Around the time the exhibit would open, Sohn said: “it will come to you all in good time, as long as you keep pushing forward. You don’t know which cloud would bring rain and when. Living is enduring. Us Koreans are enduring. A better, a new time will come. There is a time for everything.” Somebody should be paying attention to those words. “There is a time for everything.” As the exhibit opened, a collection with the same title was published - the 34th of Noonbit Collection of Korean Photographer’s Works. Once there was a decrepit public bathhouse called ’Gwangmintang‘. Around the bathhouse are a hairdresser, an egg wholesaler, a florist’s shop, an old-fashioned mechanic‘s shop, and residential houses. Every morning at 5 (except on Thursdays) the madam would sigsdg001.jpgnal the start of the day by opening the shutters of the bathhouse. 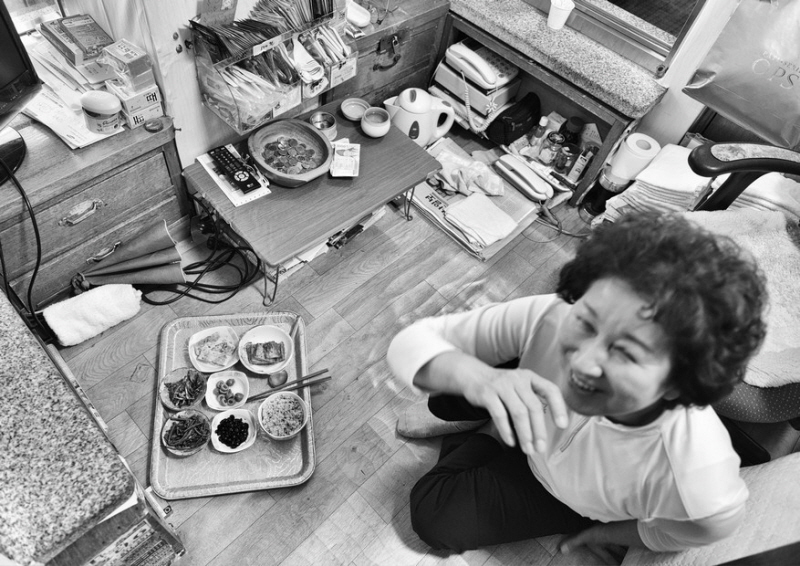 For 43 years Gwangmintang has watched the neighbors’ joys and sorrows and acted as their common room. People would greet each other, inquire after each other, and share their stories and all in all be friendly. I wanted to document the people visiting Gwangmintang. It took me 8 months to take my camera out of the bag and enter the bath. During my time there the regulars considered me to be an oddball with a camera. The reluctant sounds of the shutter of the camera were slowly moving into the humid, foggy bath. What I felt photographing Gwangmintang was similar to that of someone finding something useful at a junkyard. People were always friendly. They would take off their clothes, put them in the lockers and go into the bath with a towel in their hand. They would take a plastic chair and a bowl from the pile on the left side of the entrance and start finding “my spot”. This requires navigating through people and securing enough space for oneself. Intruding on someone else‘s territory can lead to scuffles, both verbal and physical. Most of them come to an agreement within a minute but hurt feelings do not easily dissipate, even after several trips to the cold and hot baths. Whenever potbellied middle-aged men argue over who is right and wrong with their faces turned bright red, I would watch at the corner of the bath, with my hand holding the camera on the shoulder and trying to stifle a laughter. One cloudy day, I had taken off the innerwear that had absorbed the cold and was warming up inside the bath. “Life comes and goes,” said a gray-haired man well into his fifties, just about leaving the bath. The Buddhist-like man made me think - and I imagined the mind of the water that had once embraced people’s bodies, now being drained out. Life comes and goes - and so, Gwangmintang is now gone.